I have recently missed the opportunity to participate in the local tournament. As if it was not bad already, I was not able to play against Matt (famous Dwarf general, known for his Brocks, Rocks and Glocks style and a fantastic tournament organizer), after accepting his challenge to settle our score. Fortunately for me Matt had a free spot in his busy schedule and we decided to play our challenge in the local store. 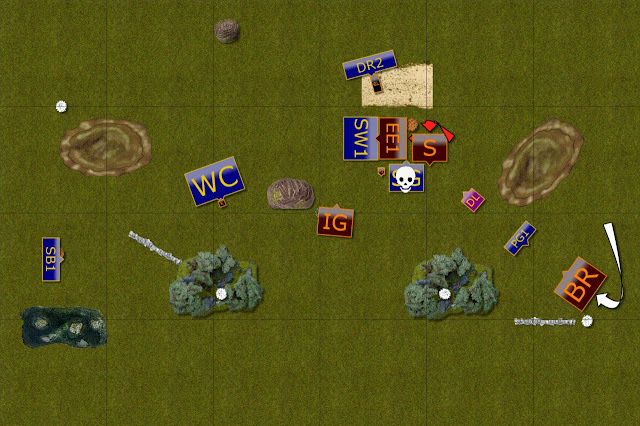 We set at usual 2000 points and randomly chosen map and scenario with the help of Epic Dwarf Map/Scenario Randomizer. The core of the army that seems to be 2 hordes of Rocks, 2 regiment of Brocks and 2-3 Glocks in the form of Organ Guns was obviously the same. But there were a few new units too. Mastiff Hunting Packs were intriguing as despite being cheap they have the potential to be quite annoying. 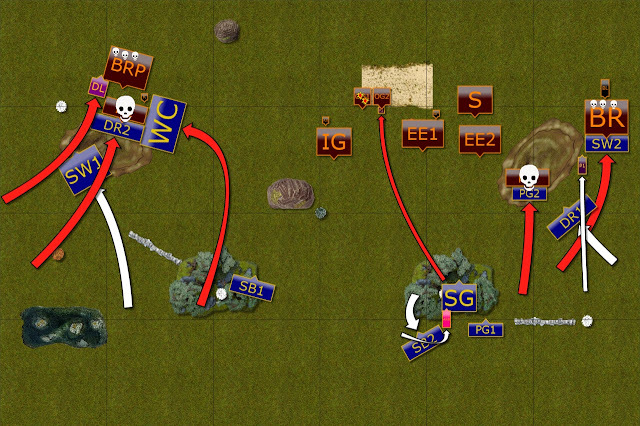 And if left unchecked, their charge from the flank against troops in particular can be painful too. There were two regiments of Dwarfs too! One with extra armor and one with extra punch. Both can add to the various aspects of the army and can work together as the typical (and quite fitting) Hammer and Anvil pair. I expected to see at least one mounted Berserker Lord and I was not disappointed. However, the King with Wings was a novelty. Having just invested in a similar hero (although Prince is not as good as the King of course) I definitely recognized the potential he brings to the army. Dwarf King has defense 6+ which means he will be even better at blocking enemies. Stone Priest was there to Surge the Elementals but I was also curious about his Martyr's Prayer and how that can be potentially utilized. 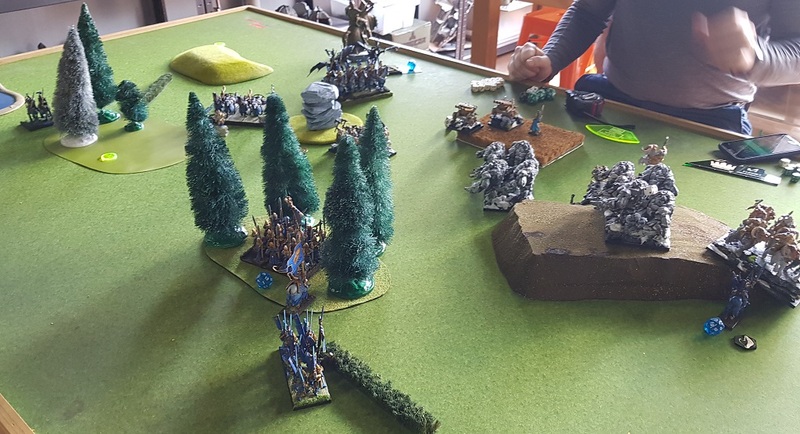 Interestingly, we both brought armies with 14 elements, although it seems that in Unit Strength department Matt had an advantage. His army is obviously slower but thanks to fast heroes and Surge, it also has good options for the movement phase. 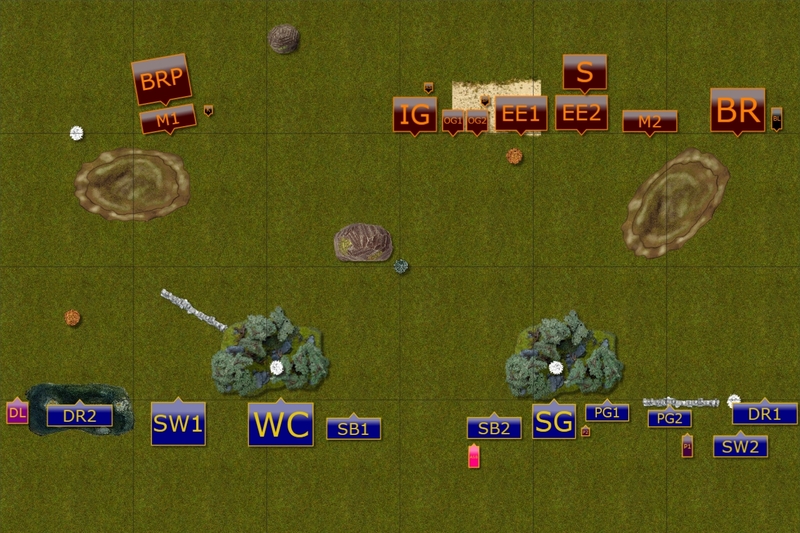 Three units with defense 6+ create a tough wall, Brocks and Shieldbreakers are there to deliver the punch while Organ Guns and Surge make maneuvering around this army much more challenging. 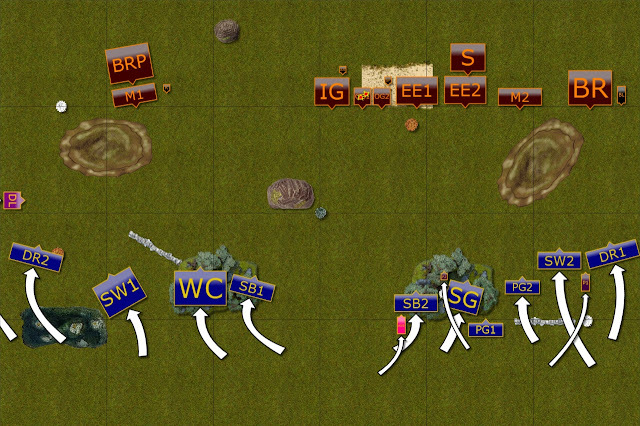 Despite the same number of elements I had a feeling Matt's army would need to adapt more compact formation. First, to keep slower units protected and second, to get that initial support from Organ Guns. It meant that he would either need to deploy in refused flank formation or leave smaller contingent on the weaker flank. This would allow me to maneuver with more freedom on that side of the battle field and I wanted to use that as an advantage. We got Ransack as a scenario and I think it is the first time I played it. It looked like a modified Pillage where the objectives are worth variable points. On the map Green = 3 points, Orange = 2 points and White = 1 point. 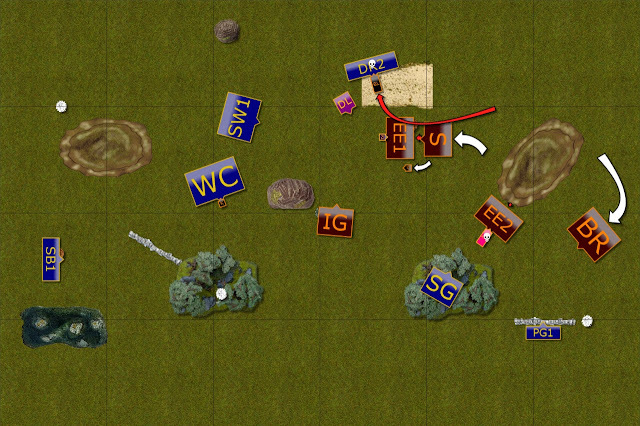 I tried to spread the tokens as I would do in Pillage and won the roll of to pick the side. I chose South and it looked like I had quite a few objectives in close proximity. I wanted to use that to contribute to the initial plan rather to change it. Hence, I deployed strong units on left flank and I intended to attack Brocks on that side. If I could do it fast I should be able to take over that side and threaten the center. The other half of the army had a difficult task of holding against quite tough and more numerous foes. What is more, Organ Guns were positioned to control the center. It meant that I probably would not be able to hold the line with the units I had there. Hence, I decided to attack rather to be static. The plan was to shoot at Organ Guns, send in flying Prince to take at least one of them and carry the fight to the enemy. That should work better in terms of slowing down, would limit the maneuverability, especially for Brocks. 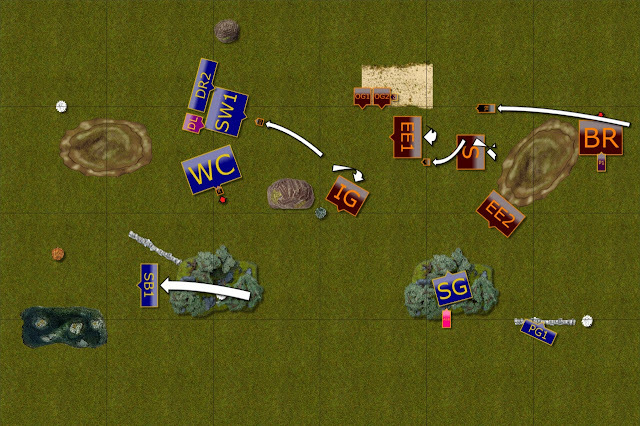 I also hoped to coordinate these actions with the attack of the units from the flank. In the end, I wanted to contain Dwarfs in their corner to prevent them from contesting the objectives and keep fast Silver Breeze in the rear to claim some of my own. I got the first turn. Usual Elven double flank advance. 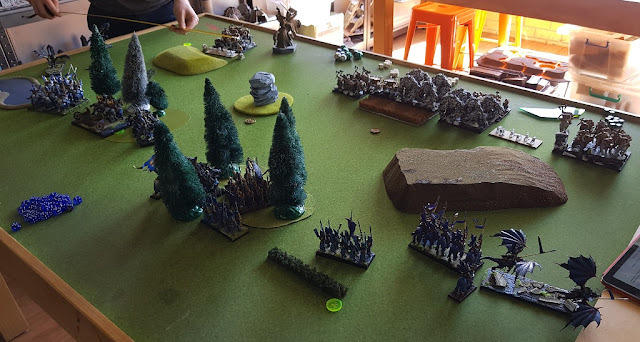 Elves moved forward on both flanks. 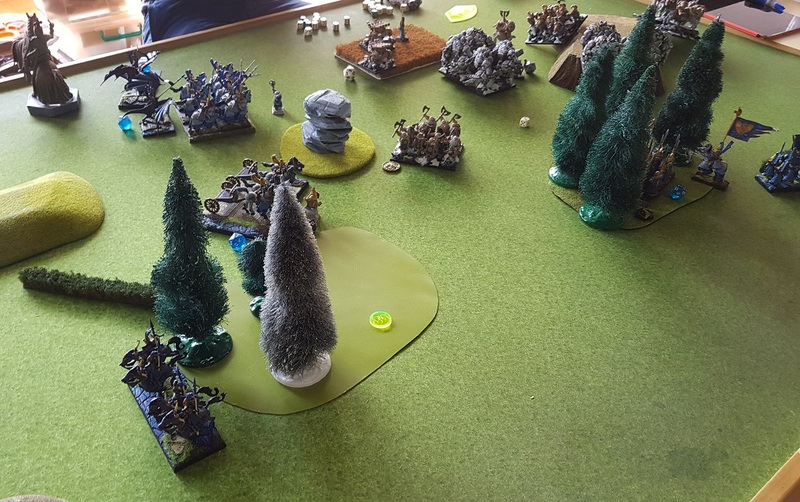 On the left the Drakon Lord tempted Dwarf King to charge him but the trap was quite obvious there. In the center the shooters all aimed at Organ Gun but as expected, the damage was not yet that significant due to the combination of movement and cover. 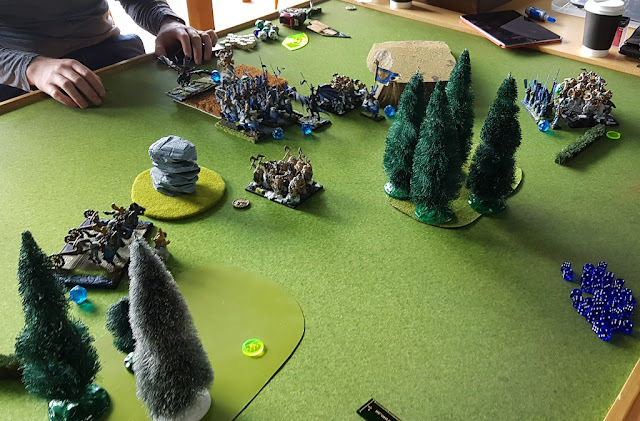 Dwarfs advance too ... but slowly. Main part of the Dwarven army advanced as well. A bit slow but they were not in a hurry. Only Mastiffs were released early to tempt Elves to attack. In the meantime, Organ Guns did a bit of a damage on the Silver Breeze but it was enough to waver the unit. Offense is the best defense. It was definitely an approach Elves chose to execute and units on both flanks attacked. 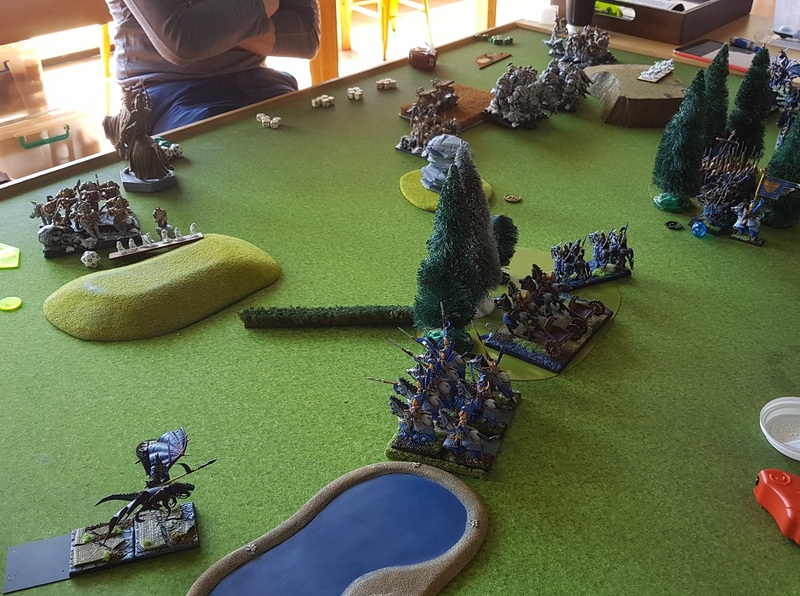 On the left, the Drakon Lord distracted the Brock Riders while Drakons and War Chariots chased away Mastiffs and prepared for attack against the Brocks soon after. Storm Wind regiment also moved fast forward to join the fight. 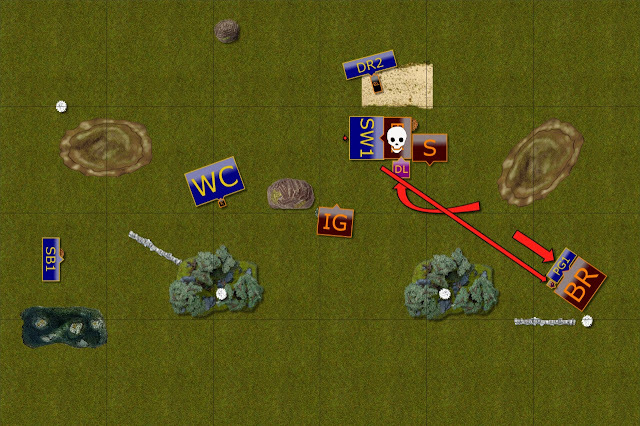 On the opposite flank Palace Guard got rid of another pack of Mastiffs in order to protect the units behind the hill. Storm Wind charged alone to stop the Brocks and give time for Drakons to fly to the rear of the enemy formation. Drakons landed close to the hill to get ready for that jump. Stubborn Dwarfs were not expected to yield easily and there was no reason to do so anyway. Brocks on the left wounded the Drakon Lord badly but he didn't even waver! Earth Elementals did only marginally better as they did waver the Palace Guard but it was not the result they were after. Only Brocks on the right managed to get rid of their enemies. 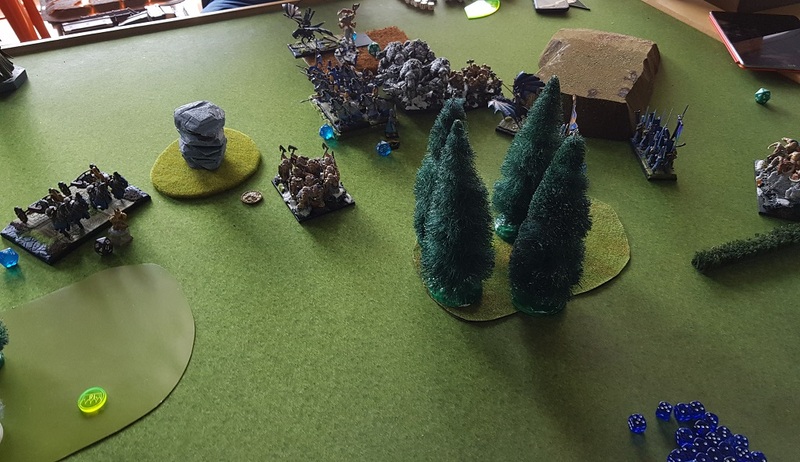 Left flank is clear ... sort of. 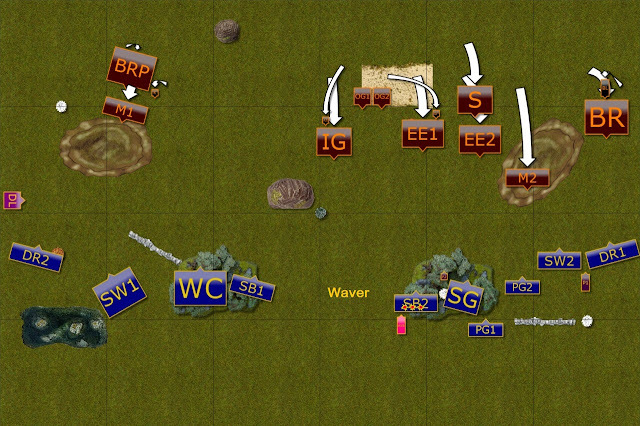 Elves continued their attack on the left flank and managed to destroy Brock Riders. However, the King was still there. The shooters in the middle kept trying to destroy the Orgun Gun but Martyr's Prayers kept it intact for longer than Elves expected. Elven Prince aka Tooth Fairy attacked the Stone Priest this time but failed to do any damage again. That was even more unfortunate as the Drakon Riders have just landed behind the enemy lines. It meant that the Stone Priest was still able to cast spells! Dwarfs are clearing the right flank. 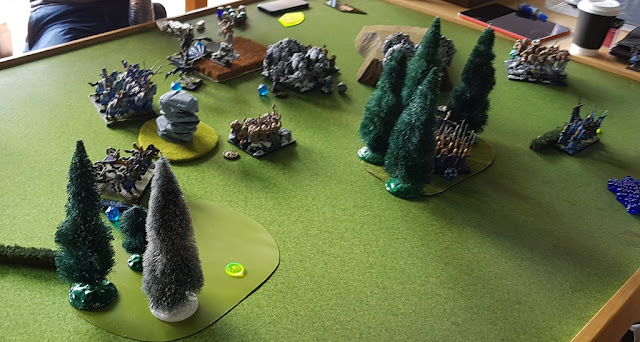 Due to the blunder of the Prince, Elves could not prevent the Stone Priest from animating the Earth Elementals and the Rocks crushed into the flank of the Elven flying cavalry. That meant that Elven plan of surrounding the enemy from few directions at the same time failed. In addition, Dwarfs eliminated the Palace Guard and the Silver Breeze units. That was a significant loss for Elven army. Cavalry rushing to the rescue. War Chariots attacked fleeing King in order to occupy him and perhaps even get lucky in chasing him off. More importantly, they blocked the line of sight to the cavalry that was rushing towards the center to help remaining units on the right flank. Please, note that Iron Guard positioned so that Storm Wind cavalry could not see it. Dwarfs started consolidating their positions around two most valuable objectives. 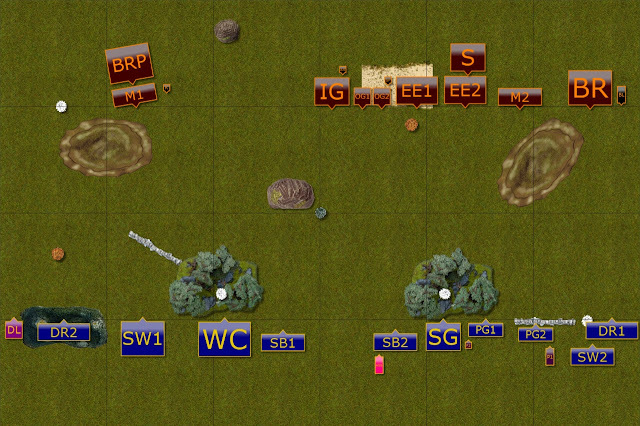 One horde of the Rocks advanced towards outflanking Elven units to stop them in their tracks. The other horde shambled towards lonely Sea Guard unit. Drakon Lord and Riders attacked the Orgun Guns and this time got rod of them for good (Edit: I have finally remembered to triple the attack! :) ). 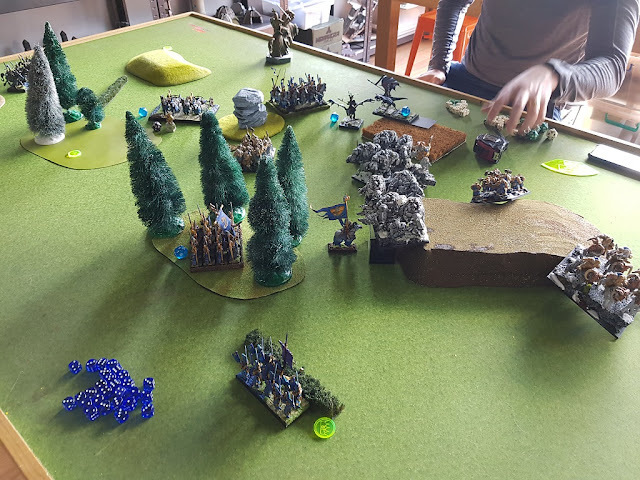 It was also important to get to good positions for the continuation of the combat as Elves had to reclaim some objectives to have a chance to win the battle. While Storm Wind cavalry managed to capture the enemy Standard, War Chariots struggled against the King. In the meantime, Elves Standard Bearer blocked the Elementals from advancing against Sea Guard. Dwarfs attack but Elves hold! The Rocks attack puny Elven heroes but somehow they hold the line! Even the Brock Lord could not rout the Drakon Riders! Would that be the chance Elves were looking for? There was nothing to lose so Elves decided for the last final gamble. After all, if they didn't the defeat was certain. There were some difficult decision to make and Elves decided to attack the Rocks. It was due to the fact that one horde would otherwise charge Sea Guard and most likely claim the objective. While the second horde was already guarding another, more valuable objective. 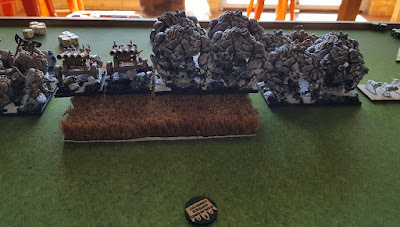 Charging Iron Guard was an option but it was less risky to expose the flank to attack from the Dwarfs than receive charge from the Rocks to the rear. Hence, Storm Wind cavalry attacked the Earth Elementals with the help of Sea Guard that first got rid of the Stone Priest. Unfortunately for Elves that cavalry charge was hindered and the damage was too low to rout Elementals on the impact. 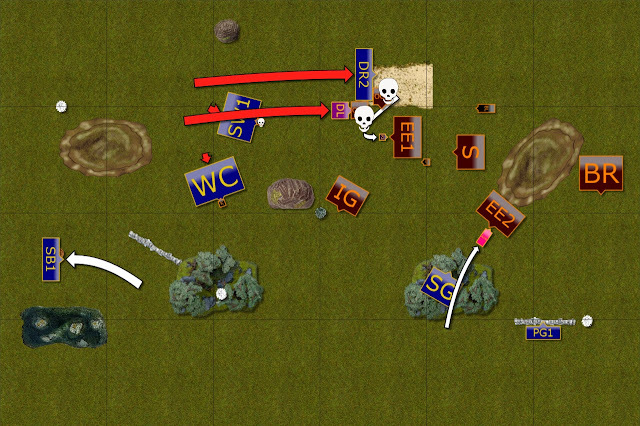 At the same time, double flank charge against the other horde of the Rocks proved to be very successful. However, Dwarfs still held the crucial objectives and what is more it was their time to counter attack. Dwarfs were determined to defend their advantageous positions and counter attacked. Shieldbreakers routed already damaged Sea Guard but Elementals did not harm Storm Wind hard enough. 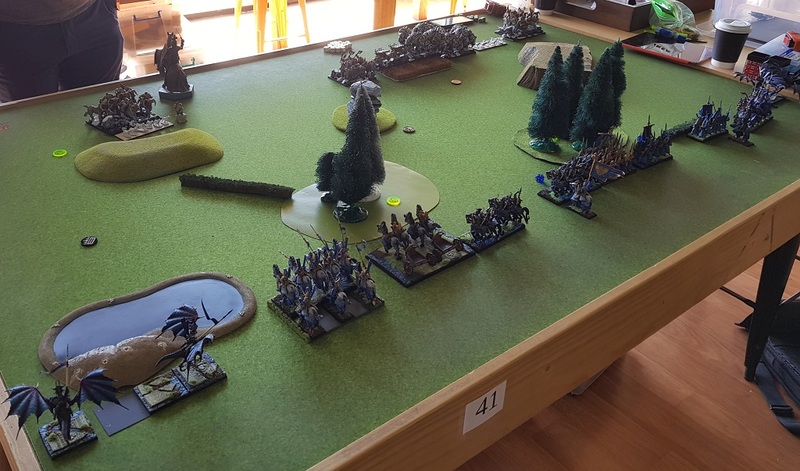 However, from the strategic point of view, Dwarfs gained more as Brock Riders could control another objective. Elves were given another chance to change the course of the battle. Storm Wind continued the attack against the Rocks and were supported by magic (Bane Chant!) and Drakon Lord attacking from the flank. It was too much even for the Rocks and they finally crumbled. 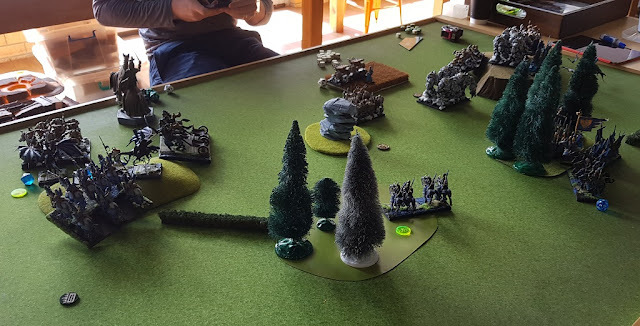 Elves claimed new objective, at least for time being! Palace Guard and the Prince attacked the Brocks but despite quite a significant amount of damage inflicted, it was still too little to break them (Edit: I believe I needed double 6's to do so). It was now up to the Brock Lord to decide the fate of the battle. He charged his counter part and challenged the Drakon Lord to single combat. Elven warrior, although badly wounded, accepted valiantly. Unfortunately, he was no match for the Dwarf and fell. That meant that the objective was now contested and Dwarfs won a bloody victory! Many thanks to Matt for a great game and congratulations for well deserved victory! In the end, Matt had 4 points to my 2 for controlling objectives. In my opinion, Matt played a solid game, never losing the scenario from the sight and kept that goal in mind from the beginning until the end. It also seemed to be the first victory for Matt in our sport rivalry, so well done on settling the score too! Immediately after the game I thought I played ok in general but when I started preparing the battle reports and the diagrams, I noticed a lot of mistakes. Not an unusual situation but it was good to analyze the game again and notice missed opportunities or bad decisions. I was happy with the advance on the left flank and that I was not shy to commit units early as that allowed me to destroy enemy fast. What I did wrong there was to abandon the objectives. 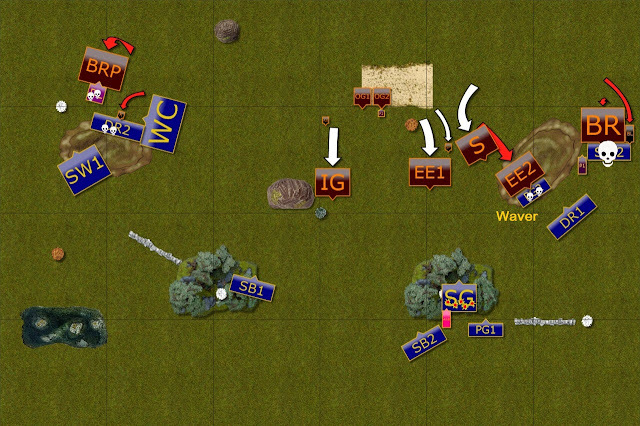 As it turned out after the game, War Chariots could potentially control 2 objectives at the same time. As their base width is 6", then can be placed 3" away from each objective, provided the markers are exactly 12" away from each other. 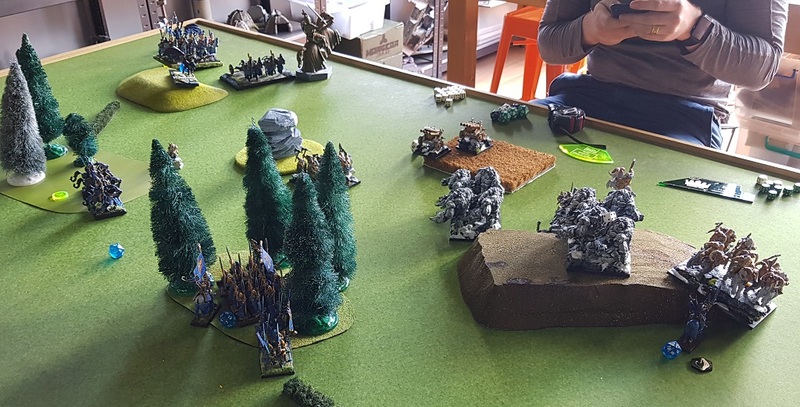 If I did that, I would also have been able to use Silver Breeze to control the objective in the forest on the left flank. it means that instead of controlling 4 points worth of objectives I had only 2. I didn't coordinate the attacks on both flanks well. I think I moved forward too quickly on the right flank. There was no need to rush as I could wait and allow enemy to approach first. 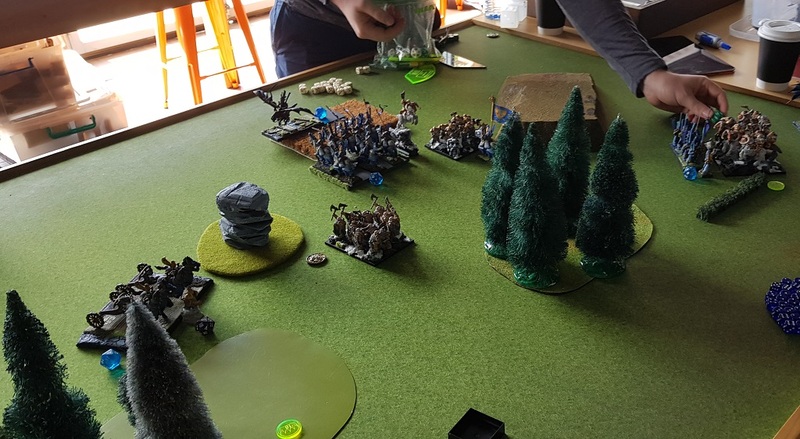 It is because I controlled some objectives already and because in waiting for 1 turn I would have bought more time for the flanking units to arrive when it was needed. Instead I committed units too early and I didn't slow down the foes enough. In addition, I lost Drakons because I risked them unnecessarily. While the odds were in my advantage when I attacked Stone Priest with the Prince, the risk was still there. And the situation showed that I was not prepared to act properly when that less likely situation happened and when Earth Elementals could have been surged to attack the Drakons. Another element I noticed was the way I used my center. Again, there was no need to move my shooters into the range of Organ Guns. I should have kept them, for the first turn at least, behind the forest. 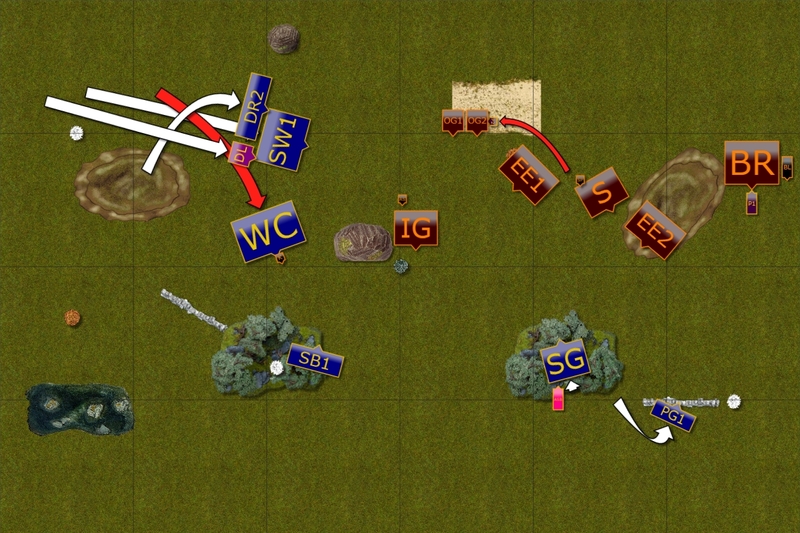 This way I would be still able to control the objectives but there was no need for me to get into range turn 1. 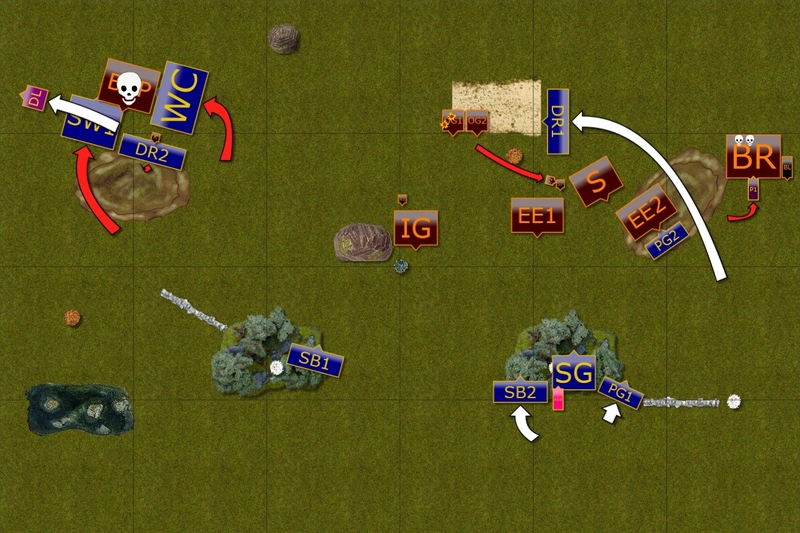 In addition, being a bit more patient would have allowed my flaking force to arrive with better coordination of the movement of the units in the center and on the right flank. But what is more, I would have avoided damage done to both, Silver Breeze and Sea Guard. The damage that allowed Matt to rout both units when he needed to do so. Hence, the conclusion is my mistakes contributed to the overall result of the game. And the main mistakes are that I was not patient with center and right flank and as a consequence, the movement off various elements was not properly coordinated. The last turns charges were still great from my point of view because it is good to know I have tools to bring down Earth Elementals. Even if the attack against Brocks succeeded or if Drakon Lord miraculously survived, these attacks were gambles. It does not change the fact I made mistakes earlier and did not play to fulfill the scenario objectives properly. Maybe next time!